The current top goalscorer of the Ligue 1 Senegal is obviously a good candidate for the “revelation of the season-award”. Guenoune is apparently a powerful striker and started the season for the newly promoted club ASC Dahra, which he joined from ASFA Dakar. After five goals for ASC Dahra, Guenoune joined the more ambitious side AS Douanes in May 2011. Guenoune has scored two goals in his first three appearances for AS Douanes. As far as I know, this is the first season at top level for Guenoune. In this post, I have written that Thiam is most likely born in 1989. Through contacts, I have now learned that Thiam apparently has a passport showing the date of birth 22.10.1992. Rather unknown striker at the Dakar Université Club. Experienced striker, born 19.08.1980. Formerly of Caykur Rizespor(Turkey) and Raja Casablanca(Morocco). In this post, I wrote that Gomis had scored six goals so far this season. I have since found trustworthy sources suggesting the correct number is five. 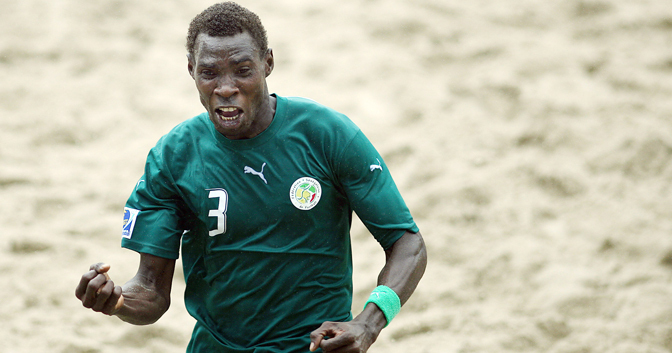 The tall, muscular striker, born 02.04.1979, is one of the stars of the Senegal Beach Soccer team. He has been fundamental to the current success of US Ouakam. Koukpaki is 193 centimeters and 84 kilos and is a handful for any defence. The picture is of a celebrating Koukpaki and is taken from beachsoccer.com. El Hadji Adama Mbaye is a striker or right-winger, born 18.12.1984. Mbaye was part of the Senegal B national football team for the CHAN tournament in Sudan. Diop is a striker with at least four seasons at ASC Yakaar. Diouck is the star striker at Linguère, born 03.12.1990. He is a very disciplined player who has been captaining the Senegal B national football team. Gai is a former striker of the Gambia national football team, born 18.06.1984. He is a tall and strong target man who has scored two goals in the last three league matches. Coly is an unknown player to me, but he is apparently an attacker. Guene is a fast winger and a great dribbler. He is born 10.05.1986 and is a former member of the Senegal B national football team. He is often captaining US Gorée. Experienced striker, born 28.12.1986. Ly was the star player of ASC La Linguère before he joined Shenzhen Xiangxue FC of China in 2009. Ly is currently forming a very dangerous striking duo with Pape Ciré Dia at ASC Diaraf. The top goalscorer at Guédiawaye FC is born 06.05.1986. Youngster who joined US Gorée from ASC Saloum before the current season. The striker is born 06.04.1991. One of the most exciting players in the Ligue 1 at the moment. Sané is an attacker who played for the Senegal U-20 national football team in 2010. He is currently part of the Senegal U-23 national football team. Sibibé is often the captain of ASC Diaraf. The central midfielder is arguably one of the best players in the league. Rather unknown attacker. Not to be confused with Yaya Sonko at Casa Sport.